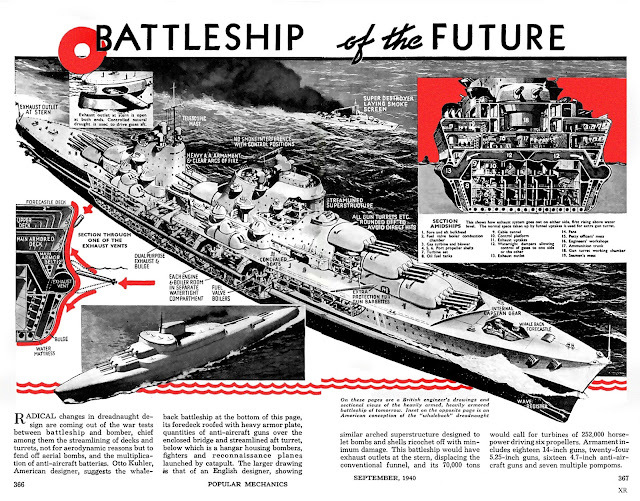 Naval Analyses: INFOGRAPHICS #20: The Battleship-Carrier and the Battleship of the Future! INFOGRAPHICS #20: The Battleship-Carrier and the Battleship of the Future! How do you imagine the warships of the future? See how an American designer was imagining in 1940 the Battleship of the Future and how another designer in 1943 was imagining the Battleship-Carrier, a battleship with extensive flight deck that could be "transformed" to a light aircraft carrier!!! From Popular Mechanics magazine of September of 1940 via James Vaughan, flickr.com. High resolution image here. 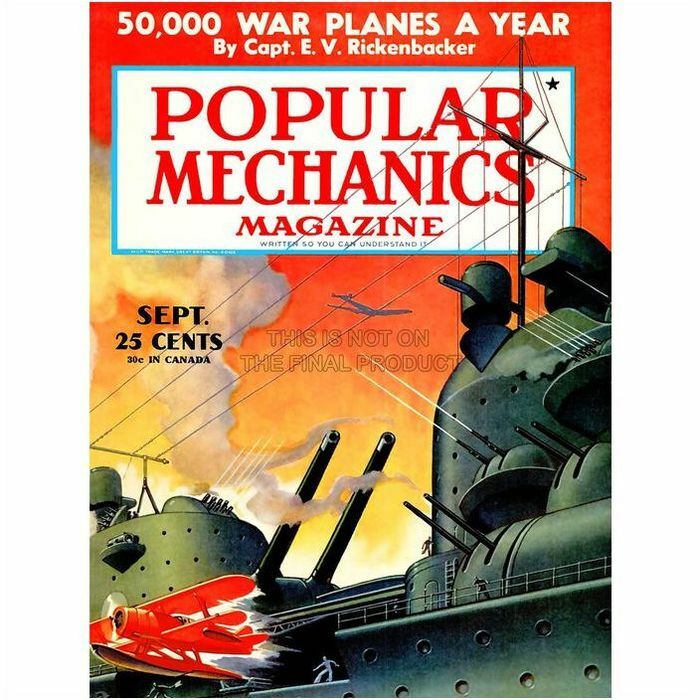 The Battleship of the Future on the cover page of Popular Mechanics magazine of unknown date. From Popular Mechanics magazine of February of 1943 via savvanah_due, reddit.com. High resolution image here. Very nice! And thank you for the HR-pix! I remember reading in "From Nelson to Vanguard" by David Brown that the hybrid battleship-carrier was seriously discussed in England but discarded in favor of continued reliance on mixed squadrons, which would - when the math was done - bring more aircraft and guns to bear relative to the same tonnage used up in construction. Also, Brown adds: "To name but a few of the problems of the hybrid, there was blast on aircraft, the long and tall, lightly protected hangar on a ship intended to fight a gun duel etc. The hybrid was dead. A more promising option was the so-called ‘aircraft destroyer’. There were four main variants but a typical option would carry twelve fighters at 31–32kts on 10,550 tons, deep. It had guns to fight off a single destroyer and torpedoes to attack a heavier ship at night or in bad weather. No-one, DNC nor staff, was happy with any of them. 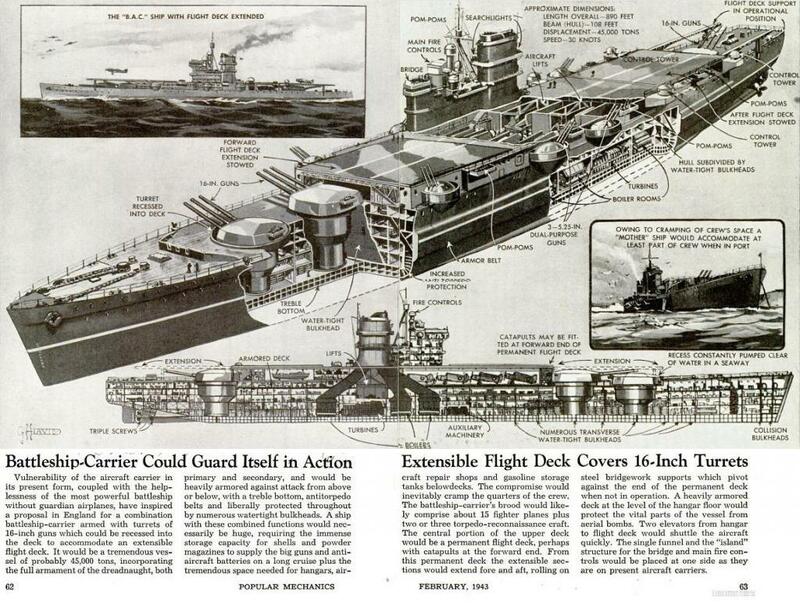 This led to further consideration of a fighter carrier with, initially, three possibilities: conversion of a liner such as Winchester Castle, conversion of Hawkins class cruisers or a new ship." As I understand it the "new ship" which eventually emerged from all this was the light fleet carrier. Thank you very much for this information! There was also discussion to build a Lion class battleship without the aft gun turret, another project that of course was cancelled. The following phrase summarize everything "The functions and requirements of carriers and of surface gun platforms are entirely incompatible"! The result from all this, except the light carriers as you said, they were also the destroyers/helicopter carriers and the cruisers/carriers. Do not forget that helicopters change completely the warship designs, a surface combatant, even a small one such a destroyer or frigate of that time, could carry a helo.